There are few keepsakes as precious as a young child’s hand or foot print immortalized in clay. The years seem to go by so fast and it’s truly a special memory to keep, remembering how little they once were. 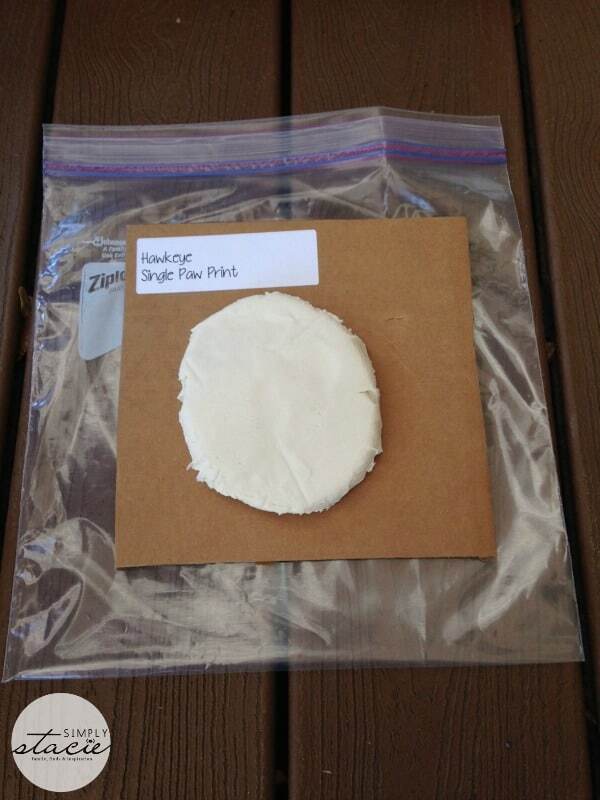 I’ve tried the at-home version of the clay print kits with no luck. They just don’t seem “finished” or polished. I think that if you can find a company that can create an imprint piece for you with love and care, you should make the investment in a quality keepsake. I’d like to introduce you to one such company – Made With Love Ceramic Imprints. I was given a site credit to the Made With Love Ceramic Imprints site to create a piece of my own. There are so many options to choose from on their site – from single hand prints to sibling trains. Their sample galleries really showcase some fantastic pieces of work. As I worked my way through the site, I was intrigued by their Paw Prints gallery – after all, pets are family too! 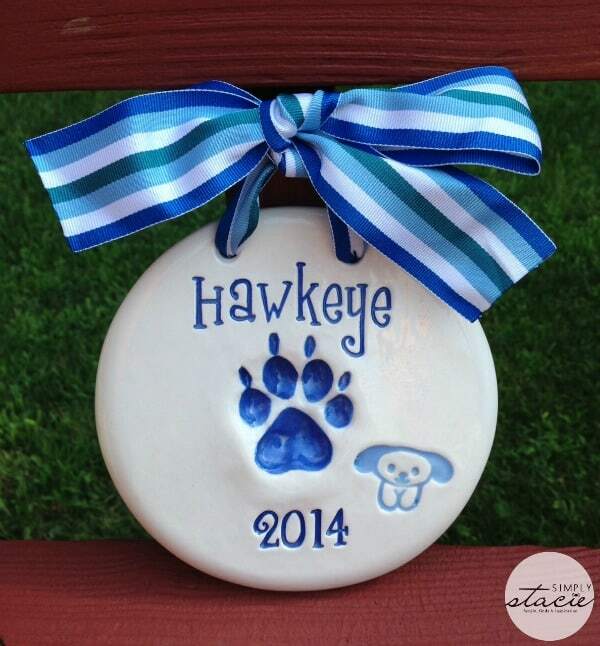 I thought a Single Paw Print plaque for my new puppy Hawkeye would be a fun piece to create. Getting started ordering online was easy. All I had to do was choose the type of plaque I wanted, and then fill out the customization form for my piece. I chose the shape, color scheme, the ribbon, the text and font I wanted, and even a little extra puppy design for the piece. After I placed my order online, I received an impression kit in the mail. It included detailed instructions on how to make an impression as well as a pre-paid box to send the impression back to the company to be finalized. I also received an email with a link for online video instructions for completing the process. It was really very easy – all I did was open up the clay package and roll it out with a rolling pin to get it ready for an impression. The hardest part was getting Hawkeye to cooperate! But even if you have stubborn puppies or kids, you don’t have to get it right on the first try – if you don’t like the impression, simply roll the clay again and try again. 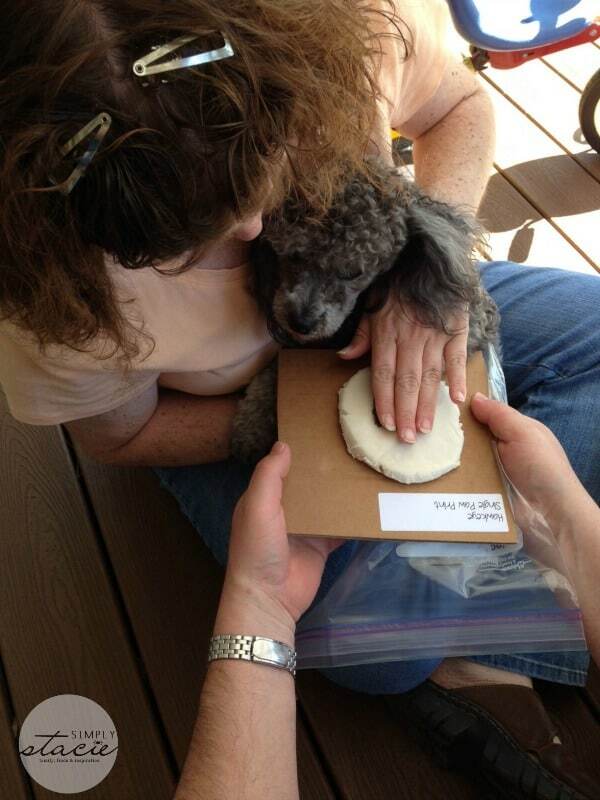 After I got a paw print I was happy with, I packed up the clay as per the instructions and dropped off the return box at the post office. After a few weeks, my finished piece arrived. This piece truly exceeded my expectations. The quality of the plaque is outstanding. The colors, the design, even the texture and quality of the ribbon is fantastic. I am in love with this piece. You can really tell that it was made with care and attention to detail (truly “made with love”!). The Single Paw Print plaque starts at $39.95. All first time orders have a $19.95 impression charge (which is waived if you use that imprint again for another piece). With that charge and the extra design options I added, my total was $64.90 for this piece and worth every penny. The typical time to process and ship a finished piece is 7-8 weeks, so keep that in mind if you want to order some pieces for the holidays or special events. Made With Love was started by mompreneurs Lisa Gomes and Jamie Viray – sisters with young children of their own. Their children were the first guinea pigs for the business to make sure the clay they were using was the perfect consistency to capture every cute pudgy finger and wrinkled hands and feet. The sisters spend part of their time setting up shop at hospitals, charity events and stores like Baby Gap, Old Navy and Pottery Barn Kids in their native California. Having mastered their design and firing formulas, they decided to take their business online so that they could share their gift with families everywhere. They also give back in a very special way through their Love Project – helping create special memories for families of terminally ill children by creating a custom piece for the families to treasure. If you have been thinking about creating an impression keepsake, check out the Made With Love website. You can also find them on Twitter, Facebook, Pinterest, Instagram, and their Etsy shop. Simply Stacie readers can enjoy 15% off on their orders through August 31st by using the code BlogLove15 at checkout. 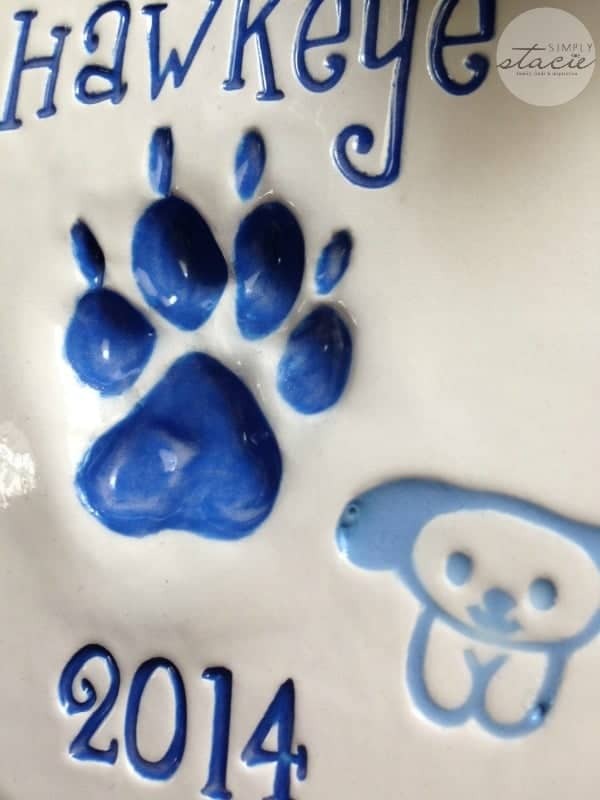 What an adorable plaque, I love that you had your dogs paw print done that’s a great idea. They definitely did a wonderful job. Thank you for sharing I will have to check them out. I have some friends who could love this idea! Will let them know about your review! Oh that’s such a fabulous idea! My sister in law has 4 fur babies, no human ones.. she takes them to get pics with Santa and the Easter bunny etc.. she will love this thanks for the review. This is so cute, thank you for the review. What a wonderful idea for a one of a kind keepsake! I love that, so cute! Would love to do that with my four fur-kids! Your clay imprint turned out really nice. This would be great for people with little children or pets, I would definitely get one. Thank you for sharing this review. This is amazing! I would love to do this with our dog! It’s totally adorable! Fur babies rock. That is such a cute idea. My friend is getting her puppy soon, this would be a lovely present for Christmas. Thank you! I have been blessed with my first grandchild and this will be pdrfect! Cute idea! I told my brother the vet about this!